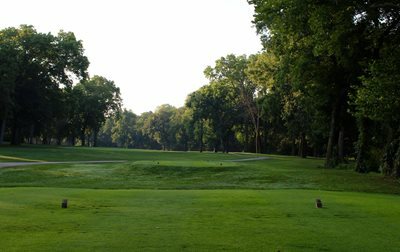 Country Club of Leawood is home to a beautiful Bob Dunning designed golf course on 110 acres of picturesque land in Leawood, KS. 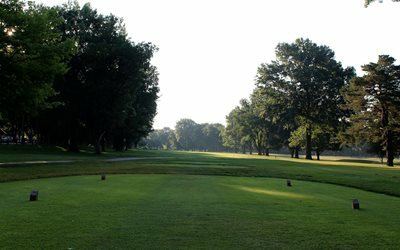 The golf course offers a beautiful front nine with several water hazards and wide open holes while the back nine is carved through the trees and requires a slightly more precise tee shot. 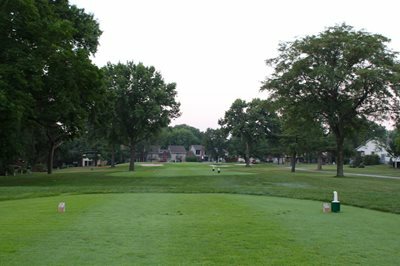 We offer several sets of tees to accommodate players of all skill levels. Installation of the Better Billy Bunker System on our course has taken golf play to a whole new level by making our bunkers more playable in all weather conditions. Additonal course features include two putting greens, a chipping practice facility and a driving range. 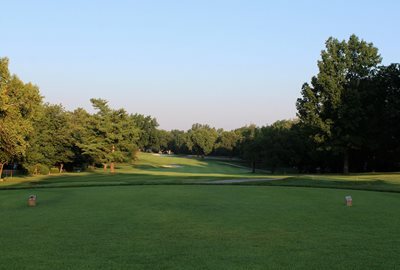 We are proud to honor club tradition by hosting two signature golf events each year; the Men's Member/Guest Tournament (The JamBaLea) and the Women's Member/Guest Tournament (The Daisy Classic). Learn more about golf opportunities at CCL by calling the Golf Shop at (913) 491 – 1313. 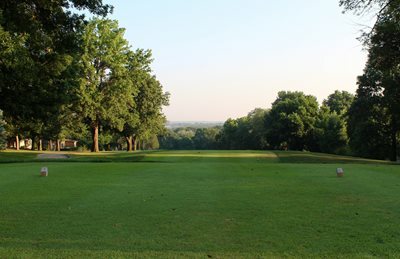 Click on the interactive scorecard below to get an in-depth view of each hole on our course. The first hole plays straight away and slightly uphill. The landing area for most tee shots is guarded by a long, narrow bunker on the left side of the fairway. The green is protected by a bunker on both the front left and front right. Two solid shots on this opening hole and you can start your round with a birdie. Depending on the wind, this hole can force you to play a wide range of shots. 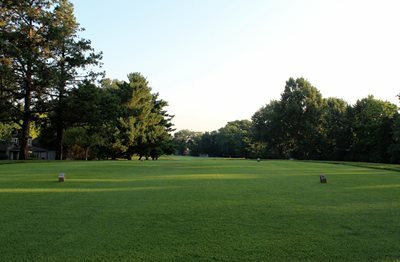 This hole plays into the prevailing wind which can force a long iron shot into this green that is guarded by tall trees. The 2017 bunker renovation added two greenside bunkers to the right in addition to the front left bunker. Any long iron shot that is off line runs the risk of hitting a tall tree and forcing a difficult up and down for par. This is another hole that can challenge all the clubs in your bag. 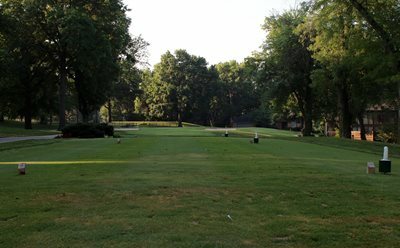 From the tee, this hole doesn't look that intimidating, but miss the fairway left and you could be blocked to the green by a row of trees; miss the fairway right and you could be faced with a mid-iron shot out of a fairway bunker. The green is protected by two bunkers in front of the green. If the hole plays into the wind, par is a great score. This par 4 doglegs to the right. The corner of the fairway is protected by two bunkers. This hole will tempt the long hitters to cut the corner of the dogleg and leave themselves with a wedge into the green. If you miss this fairway you will likely battle bunkers and trees to get to the green. This hole starts with a tough drive over the water to a fairway that has a perfectly placed fairway bunker in the landing zone. If you are a long hitter you might take the risk to carry the bunker, but be careful because the fairway tightens up considerably. After the tee shot you will hit back uphill to an undulating green protected well by a bunker on the front left. This is the only hole on the course with water on both sides of the fairway. 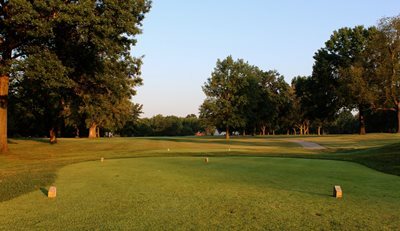 If you decide to lay up to this green, you will be forced to land your ball in a fairway that is guarded by water on both sides. This green, which is one of the most undulated on the course, is guarded by two deep green-side bunkers. 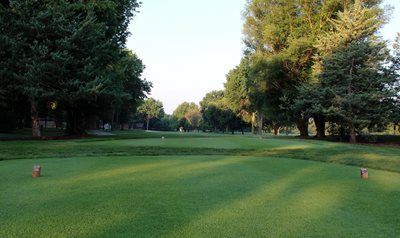 This medium length par 3 has a wide, undulated green that is protected by a left green-side bunker. Be cautious to a back left pin as any shot pulled is likely to get caught up in the trees short of the green and provide a very difficult up and down. Center of the green is always a great play on this hole. This can be an intimidating driving hole. 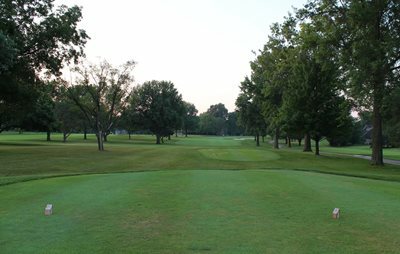 The eighth hole is a dogleg right with trees lining both sides of the fairway. The fairway bunker at the corner of the dogleg can be difficult to see for someone who is inexperienced with the course. This hole doesn't get any easier after a good tee shot. 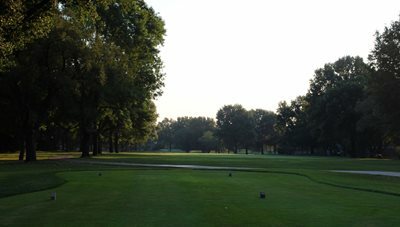 The two-tiered green can be difficult to navigate and is protected by a deep green-side bunker on the left. Avoid hitting shots that miss long and left of this green. The ninth hole is a fairly straight hole with another deceptive fairway bunker. This long, narrow bunker extends diagonally farther into the fairway than most players realize. It can create a narrow landing area for the longer hitters. The green is protected by a bunker back left and front right of the green. Out of bounds is also close directly behind the green. 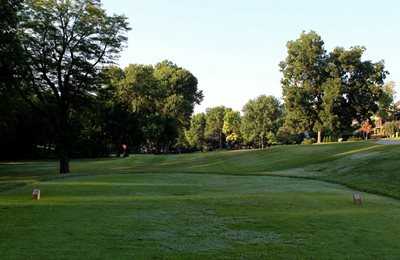 This short par 4 is a friendly way to start off a tough back nine. Be careful of the large fairway bunker protecting the left side of the fairway and out of bounds both left and right. A good tee shot should set you up for a short iron or wedge into this relatively flat green for birdie. A good tee shot down this tree lined fairway will set up a mid-iron shot into an elevated green. Any tee shot missed badly left or right will require a punch shot to get back to the fairway. Sand bunkers guard the green on both sides which will make shots left short of the green a tough up and down for par. This hole is the beginning of the toughest stretch of holes on the golf course. The 12th hole is a dogleg left. 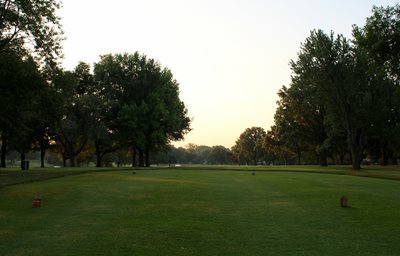 It is a very tight driving hole with trees and out of bounds on both sides. Players should try to place their drives at the top of the hill to have the best shot at the green. Any tee shots that are hit long and right of the fairway will likely to be out of bounds. The green is the deepest on the golf course and is protected by a bunker on the right. This is one of the most underrated holes on the golf course. Most players will be hitting a long iron or hybrid into this green. The hole plays slightly uphill which makes it play longer on most days. The green is protected by a sand bunker on the left and right. Be aware that the green pitches front to back so getting a ball over the bunkers and stopped on the green requires a great shot. Par is an excellent score here. This short par 4 requires accuracy from the tee. A fairway metal is usually the smart play here; a bunker down the right side sees plenty of traffic and makes for a tough second shot. Be mindful of the right side as well, miss right and you could be blocked out by a long line of trees. The second shot plays downhill into a large two-tiered green. 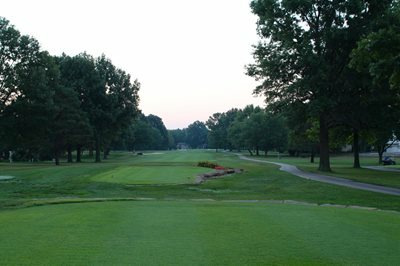 A well-struck tee ball with a right to left flight will reward you on this challenging slight dogleg left par 5. From there it’s a long iron or fairway wood into the green guarded by a front water hazard and a large tree on the right side. The green slopes from back to front. Two well-struck shots could have you on your way to a great birdie, but miss either of them and you’ll have to work for a par. Our signature hole, #16 is a short dogleg left par four. A precise tee ball is required here. 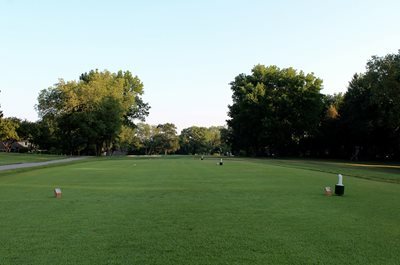 The left side of the fairway is tree lined so be sure to hit it far enough down the fairway or to the right, or else the trees may block your approach shot. 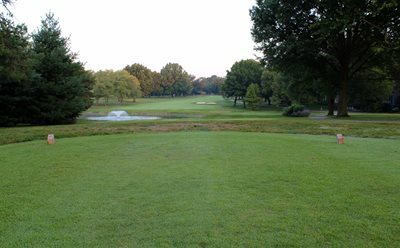 The approach shot is a mid to short iron that plays over a small creek to an elevated green that slopes from back to front. Par is a great score here. The final par 3 on the course plays slightly uphill with a prevailing wind. Club selection is key, usually a mid to short iron. A deep bunker short right that makes for a difficult up and down guards the green. A well played shot will usually leave a fairly easy birdie putt. The 18th hole provides a great and tough finishing hole. 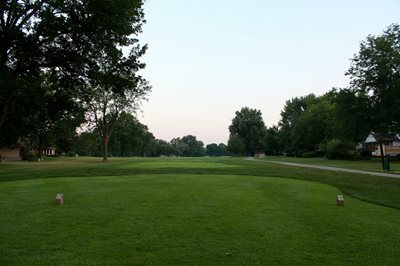 Your tee shot must avoid the trees that creep into the left side of the hole, but too far right is out of bounds. After a demanding tee shot the second shot plays into a long green that is protected by a deep bunkers on the right and left. A par here is a great score. 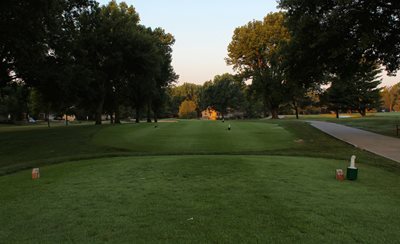 Interested in hosting an outing or golf tournament at Country Club of Leawood? Find out more by contacting Ryan Fitzpatrick, Head Golf Professional.